"Golden Hour" is the seventh studio album and fourth major label album by American country music artist Kacey Musgraves, released on March 30, 2018, through MCA Nashville. Musgraves wrote all 13 tracks and co-produced the album with Daniel Tashian and Ian Fitchuk. Golden Hour has received widespread acclaim from music critics. At Metacritic, which assigns a normalized rating out of 100 to reviews from mainstream critics, the album has an average score of 92 out of 100, which indicates "universal acclaim" based on 6 reviews. With Golden Hour, pop-country singer-songwriter Kacey Musgraves delivers a warm, vulnerable album chock-full of masterful love songs that ring pure and true. Musgraves sounds more confident as a musician than she ever has — and her superb debut album, Same Trailer, Different Park, and its follow-up, Pageant Material, were hardly meek. 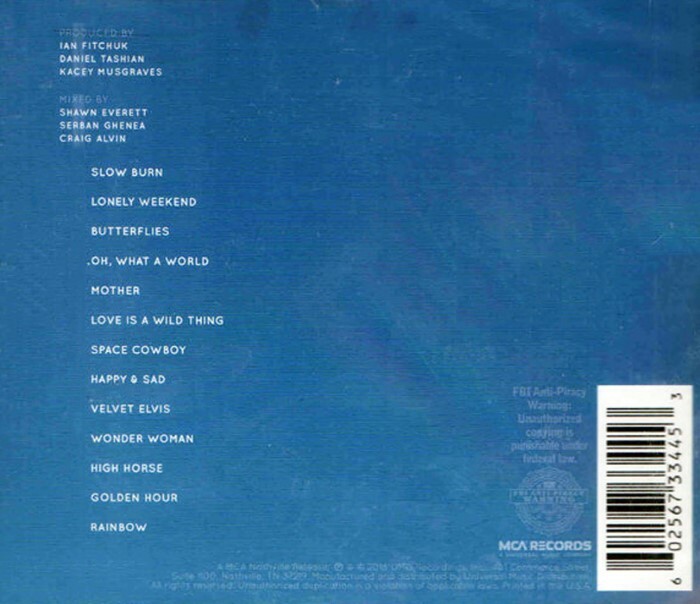 The record features just as many infectious odes to the magic of romance and partnership — such as sweet, dreamy single “Butterflies” and the glowing, adoring title track “Golden Hour” — as it does grounded, introspective songs that shine light into the dark spaces that eventually show up when two people commit to revealing themselves fully to one another. There are two tracks on the record that are just delicately managed enough to be called brilliant. The first is “Mother”, a stunning slip of a song that, in less than a minute and 30 seconds, uncovers the aching love that flows through generations of women and has never failed to bring me to tears. The second is album closer “Rainbow”, a rich, exquisite piano ballad evoking the best of Elton John. The Verdict: Golden Hour is the steady and self-assured product of an audacious artist whose body of work speaks for itself. The record exemplifies the deep and powerful magic of pure goodness. Musgraves hits one high note after another on Golden Hour; her talent as a songwriter and melody-maker is second to none, and each song is thoughtful, well-formed, and a delightful experience on its own. Together, the tracks on Golden Hour add up to an honest, cohesive musical experience that will linger in your mind and heart long after the final notes have faded. Reviewed by Kayleigh Hughes for consequenceofsound.net.